Our movers’ team meticulously organize your move to make sure all your documents and furnitures arrive intact and organized. We will label all the boxes to make sure everything is placed at their place. Our movers will ensure that all your electronics arrive in working order. We take good care of your office furniture. Nunavut Moving & Services’ supervisor will oversee your move to make sure everything runs perfectly smooth. We know time is important, we will organise our move to minimize any downtime and to get you back to business as quickly as possible. 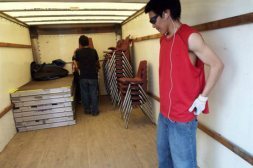 At Nunavut Moving & Services we understand that you need to have your resources at your disposal right away, so that you can serve the community better. Nunavut Moving & Services will ensure fast and convenient deliveries of items to your office location. We have the packing and transport skills to keep your commercial belongings safe. No matter what you need to move, we’ll make sure it arrives on time and unscratched.